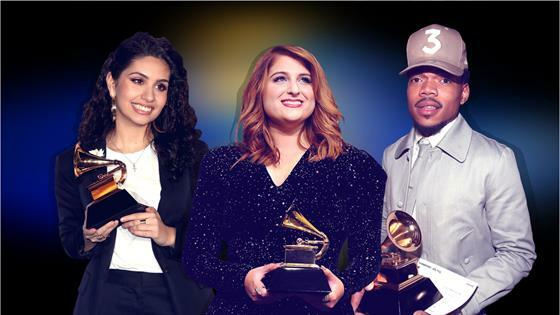 In just a few days, music's biggest stars will gather at the Staples Center in Los Angeles to celebrate the work of their peers. Kendrick Lamar and Drake head into the night with the most nominations—earning eight and seven, respectively. Brandi Carlile is also a top contender with six nods and Cardi B, Childish Gambino and Maren Morris are up in five categories each. However, these stars face some tough competition from a few newbies. H.E.R., one of the musicians up for Best New Artist, is also in the running in five categories, including Album of the Year. Chloe x Halle, additional Best New Artist nominees, are going up against some heavy hitters, too—including Jay-Z and Beyoncé in the Best Urban Contemporary Album category. Luke Combs, Greta Van Fleet, Dua Lipa, Margo Price, Bebe Rexha and Jorja Smith are the other nominees in the Best New Artist category. While some music lovers consider the honor a career breakthrough, others consider it a curse. To see for yourself, check out 20 years of winners via the gallery below. The "Where Have All the Cowboys Gone?" singer was nominated for seven Grammys in 1998, winning only the Best New Artist award. In 1999, the former Fugees singer took home a total of five Grammy Awards for her work on The Miseducation of Lauryn Hill. She's won eight over the course of her career. XTina's career has only gotten bigger since the "Genie in a Bottle" singer took home the Best New Artist Grammy 19 years ago. She's been nominated a total of 20 times. This Grammy win marked the country star's first and only Grammy win and nomination. The musical lady has been nominated 29 times in her career. She's taken home 15 of them. Jones has been nominated for 16 Grammys, winning nine of them so far in her career. The same year, the band also won Best Hard Rock Performance for "Bring Me to Life." The group of guys has nabbed 13 Grammy nominations and won three Grammys awards over the years. Chrissy Teigen's main man won the award for Best New Artist on Feb. 8, 2006. He's won 10 Grammy awards over the years. Carrie's been nominated 14 times and won a total of seven Grammys. The throwback singer stole the show when she was awarded the Best New Artist award for Back to Black. She received a total of eight nominations and six wins before her death in 2011. The British singer has won a whopping 15 Grammys in her career. In addition to winning Best New Artist that year, she also snagged the Best Female Pop Vocal Performance for "Chasing Pavements." The band has been nominated for eight Grammys since 2010 and has secured three wins. Last year, the country group got a nom for Best Country Duo/Group Performance for "My Old Man." In a surprising move, the jazz singer beat out Justin Bieber and Drake for the Best New Artist Grammy. She has a total of three Grammys. Justin Vernon, the man behind Bon Iver, surprised many when he won the highly coveted award. He has a total of two wins. The group's 2012 album, Some Nights, sold more than three million copies in the U.S. and was nominated for two Grammys. The musical duo received five nominations at the 56th Annual Grammy Awards, winning three categories, including Best New Artist, Best Rap Album (The Heist), Best Rap Song and Best Rap Performance ("Thrift Shop"). The young English soul singer took home the Grammy for Best New Artist at the 57th Grammy Awards. He also took him three more Grammys that year. His debut album, In the Lonely Hour, was nominated for album of the year. "Stay With Me" earned Grammy wins for Song and Record of the Year. Winning the award at age 22, Meghan said during her acceptance speech, "I have to thank L.A. Reid for looking at me as an artist instead of just a songwriter—and my mom and dad." In 2015, the "All About that Bass" singer was nominated for Record of the Year and Song of the Year, but lost out on both. His 2016 album Coloring Book took off with flying colors. He has a total of three wins. The singer was also up for Best Music Video, Song of the Year and Best Pop Duo/Group Performance.